Cantinho do Avillez – casual fine dining. A good place to share a lot of mid-size dishes and pick a nice wine. You have to have the cubed hazelnut. Book for this place *now*, it’s always booked days in advance. I see he has opened a place with the same name in Porto now too, so consider it in both cities if travelling on a longer trip. Mini Bar – this is a nice late night bar with music and cocktails, and they serve a full molecular gastronomy degustation menu of 10+ dishes. His latest place. We had our menu sitting in the bar while watching the kitchen and I found that to be really fun. Cafe Lisboa – this is a theatre restaurant, so it’s not all for the food and it’s not as exciting. I’d give this a pass, just mentioning it in case the name comes up. Not a bad option, just that the theatre is more the thing here than the food. In addition Bel Canto has 2 michelin stars and is probably sublime. I have not been there but next time I go I will most definitively try it. For food otherwise, I’d recommend keeping an eye out for Pasteis de Nata (an egg cake), espresso coffee, sheep cheese, grilled sardines, mixed shellfish and seafood plates (mariscos mixtos), white bread, rotisserie chicken and hot dogs. They actually do remarkably good hot dogs. I also love fresh crab which is great value in Portugal. Tapas in Portugal is called petiscos, and the dishes are generally completely different from Spanish tapas. I enjoyed petiscos a lot, but it’s not as common as tapas in Spain so you’re probably not going to run into it. Bacalao (reconstituted salted cod) is the national dish and ok to try. I love it but it took me quite a few tries to get the taste for it. I prefer a Bacalao a Bras (cod, potato chips, olives and scrambled egg) with a cold beer in the sun for lunch. Stay clear of: steak, they don’t do that well. Cuisine from other countries (skip mexican, indian, and so on, even if it’s highly reviewed). Francesinha in Porto – this is a local speciality that you will probably be introduced to if you visit Porto. It’s a fun thing to eat if you got a lot of time, but don’t waste a meal on it. It’s basically the ultimate hangover sandwich. And of course, port wine and madeira. But don’t forget to enjoy normal Portuguese wine either! Here’s a few things to do too. I generally bias towards modern stuff rather than displays of history – Americans might have other preferences! Museu Berardo – this is just a very good contemporary art museum, in an interesting building. This is in the grand tourist/museum part of town. I liked with this that the contemporary art had a very clear bias to portugese world artists (Brazil, Pt mainly) which is noticeably different from the rest of the world. Café A Brasileira – this is a bit of a tourist trap, but it’s a 110 year old cafe in central Lisbon so you can drop by and have a quick espresso and get it over with it in 10 minutes. Go inside here, don’t sit outside. 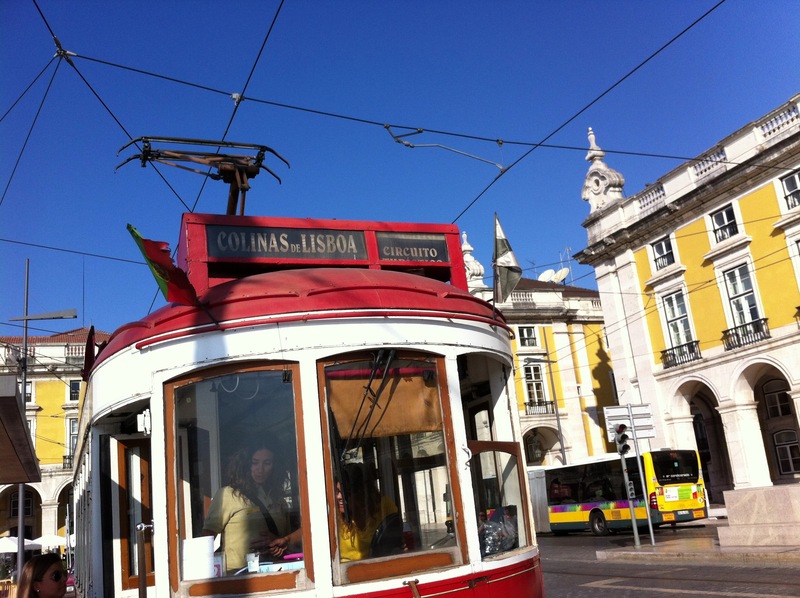 Just walk around – Both Porto and Lisbon are amazing cities to idle around in. Lisbon is extremely low on crime and you can just explore freely. The old town is basically the entire city. If you go towards the neighbourhoods Bairro Alto, Chiado, Se and Alfama you will have more fun (they’re all parts of the old centre). Shopping is quite fun in Lisbon, actually, even if you don’t generally like shopping. Pop into the little shops and pick up some oddities, foods or wines at friendly prices. The thing to buy in Portugal is shoes. The Oceanarium – https://www.oceanario.pt/en – One of my favourite oceanariums. It’s got one mega tank + four different zones you can see above and below water. We went here several times but a bit out of the way, and in a modern part of town not very representative of the uniqueness of Lisbon so maybe more for a longer trip. Sintra – this is where me and my wife got married! It is an ancient town where royalty has traditionally withdrawn to when Lisbon gets too hot. It’s a volcanic hotspot and microclimate. It has lots of castles and old buildings, and is surrounded by a national forest park. It’s a very popular place for a day trip from Lisbon and people often include it in their itinerary even for short trips. If you go, visit the mystic garden of Quinta da Regaleira. It was built by an eccentric free mason and is apparently capturing a free masonic interpretation of man’s path to find God. You can spend a fair amount of time exploring this. The hotel we got married at is called Lawrences Hotel and they used to have a good restaurant but at the moment I’m unsure if I would recommend it (I think it’s a bit hit and miss these days). (NOTE: I will go back and update this next time I visit). If you want to go to Sintra, I suggest just using Uber to save time instead of messing around with the trains, which is what you’ll normally see people recommend. It’s probably around $50 one way. Cascais – we lived here for a while. It’s a beautiful little village with some nice restaurants, nice scenery and bars, but I don’t think you should go here on a short trip. My remaining suggestions for Lisbon are best on summery days. The two main beaches to go to are Costa Caparica (enormous sand beach) and Praia Guincho, both fairly far from Lisbon (45m-1h drive). I would also go to Praia Guincho on a very stormy night, as it’s super exposed to the Atlantic, and there’s a lot of very good restaurants there overlooking the dramatic landscape (Michelin star quality + mention quality). In Porto I had one of the best days ever just walking between port houses testing port flights all day. I don’t really know a whole lot more about Porto as I haven’t spent a lot of time there. Portuguese people, particularly older ones, can sometimes come off as a bit salty. Don’t take it personally and keep a good mood. Send back the snacks you don’t want, when they give it to you before you order at a restaurant. Don’t stress about it, though. Because they do charge for all the snacks, a lot of first time visitors say yes to everything and think this is a scam when the bill comes, but it’s just how it’s done and I personally appreciate a few olives and bread while browsing the menu now. All the places I mentioned you can make do with English and don’t need Portuguese. Do not under any circumstance try to make do with Spanish. They do understand but really dislike foreigners not getting that it’s two different languages. You won’t get in trouble, they just won’t be very helpful. Keep a keen eye on your belongings on the trams. You probably might not use the tram, but you’ll see when you’re there that they are actually quite special experiences, so you might. Do not despair if it rains. Lisbon and Porto are both amazing cities in the rain. I would very much recommend Sintra in the rain, though. I would recommend Anthony Bourdain’s No Reservations from Lisbon.